I love that Mother Nature provides us with food: ripe, fresh, and free. On my walk today I spotted a stalk of asparagus in an open field. 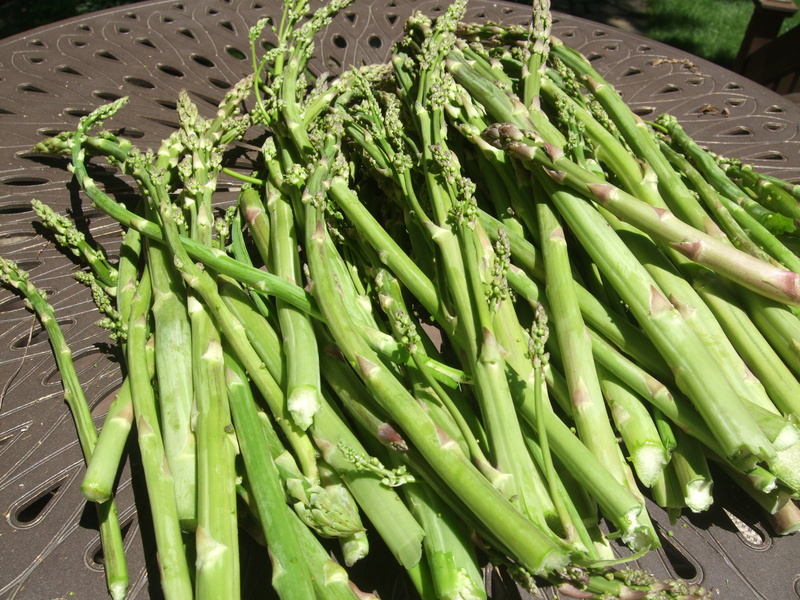 Usually, I go asparagus hunting just after Mother’s Day here in Illinois, but I didn’t get it done this year. I was thrilled that I wasn’t too late. I feasted on the tender, sweet stalk and adjusted my eyes to asparagus-mode and soon spotted another stalk, and then another, and another. I hit the mother-lode! 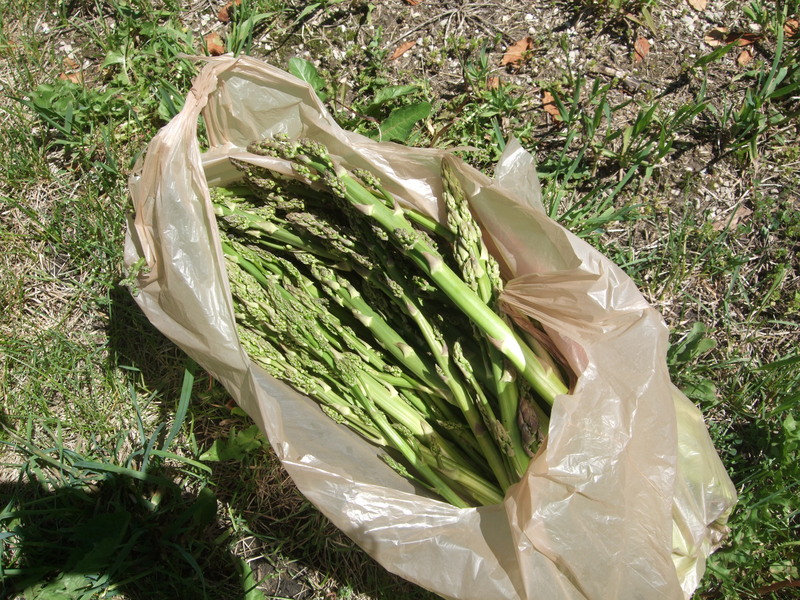 Within a mile’s walk, I picked six pounds of juicy, green asparagus. 1) Start in the Fall when you’ll see the tall, green fern-like plants. Remember their location and visit them again after Mother’s Day. 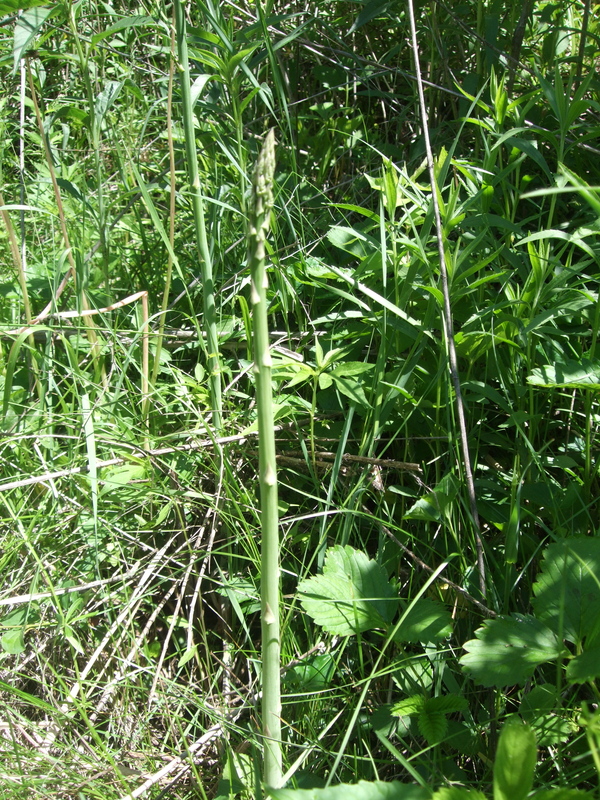 2) Asparagus seems to like sunny locations along the roadside, in open prairie, and at the edge of farmer’s fields. 3) Look for patches of grassy-type weeds about knee high. Asparagus stalks will send up a spear a foot or two above the weeds. Look for its profile. Where you find one, you’ll likely find another. 4) Watch for the unique shape of mature plants and for dried out plants from last year. Younger plants may be nearby. 1) Start near the ground and feel along the stem, testing its bendability between your thumb and finger. If it flexes, test higher up. When it snaps of crisply, you got the best part. You might also use a knife for a clean cut, but you lose the benefit of touch. 2) Don’t pull the plant up by the roots. Let it stay to send up more shoots. 3) Don’t pick stalks with too many flowerettes at the top. They are apt to be fiberous, because they’re older and going to seed. We’ll need the seeds for a good crop next year. When my bag was full, I decided leave the rest for pickers yet to come. A Vietnamese couple walking the path were surprised by the several stalks I gave them. I pointed them toward the field, and they became happy pickers, too. Thanks for visiting, Tad. I hit the mother lode at the right time– on a warm day, after a rain, and early enough to beat other pickers. A great way to spend a morning.